AbstractThe hindgut and foregut in terrestrial isopod crustaceans are ectodermal parts of the digestive system and are lined by cuticle, an apical extracellular matrix secreted by epithelial cells. Morphogenesis of the digestive system was reported in previous studies, but differentiation of the gut cuticle was not followed in detail. This study is focused on ultrastructural analyses of hindgut apical matrices and cuticle in selected intramarsupial developmental stages of the terrestrial isopod Porcellio scaber in comparison to adult animals to obtain data on the hindgut cuticular lining differentiation. Our results show that in late embryos of stages 16 and 18 the apical matrix in the hindgut consists of loose material overlaid by a thin intensely ruffled electron dense lamina facing the lumen. The ultrastructural resemblance to the embryonic epidermal matrices described in several arthropods suggests a common principle in chitinous matrix differentiation. The hindgut matrix in the prehatching embryo of stage 19 shows characteristics of the hindgut cuticle, specifically alignment to the apical epithelial surface and a prominent electron dense layer of epicuticle. 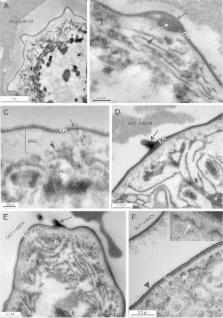 In the preceding embryonic stage – stage 18 – an electron dense lamina, closely apposed to the apical cell membrane, is evident and is considered as the first epicuticle formation. In marsupial mancae the advanced features of the hindgut cuticle and epithelium are evident: a more prominent epicuticular layer, formation of cuticular spines and an extensive apical labyrinth. In comparison to the hindgut cuticle of adults, the hindgut cuticle of marsupial manca and in particular the electron dense epicuticular layer are much thinner and the difference between cuticle architecture in the anterior chamber and in the papillate region is not yet distinguishable. Differences from the hindgut cuticle in adults imply not fully developed structure and function of the hindgut cuticle in marsupial manca, possibly related also to different environments, as mancae develop in marsupial fluid. Bacteria, evenly distributed within the homogenous electron dense material in the hindgut lumen, were observed only in one specimen of early marsupial manca. The morphological features of gut cuticle renewal are evident in the late marsupial mancae, and are similar to those observed in the exoskeleton. Recent advances in understanding mechanisms of insect cuticle differentiation. Insects possess a cuticle that covers all tissues exposed to the outside world including the body, the fore- and hindgut and the luminal side of the tracheae. The cuticle is a multifunctional device that protects its carriers against dehydration, arms them against predators, constitutes a physical barrier to prevent pathogen entry and serves as an exoskeleton allowing locomotion. Depending the developmental stage and the body part, the composition and function of the cuticle changes. The body cuticle of larvae of holometabolous insects for example is soft while their cuticular head skeletons used to chew food is hard. In spite of these differences, the basic architecture of the insect cuticle is evolutionarily well conserved between developmental stages and between species. The insect larval cuticle is formed at the apical site of a monolayer of polarised epithelial cells that differentiate concomitantly during embryogenesis. The stratified structure of the cuticle results from the concerted unfolding of basic cellular functions including timed transcription, biosynthetic enzymatic cascades, secretion and membrane trafficking as well as elaborate extracellular self-organization of the components. The aim of this review is to summarize recent advances in understanding these processes. Copyright 2010 Elsevier Ltd. All rights reserved. Cuticle differentiation during Drosophila embryogenesis. The constitutive criterion for the evolutionary successful clade of ecdysozoans is a protective exoskeleton. In insects the exoskeleton, the so-called cuticle consists of three functional layers, the waterproof envelope, the proteinaceous epicuticle and the chitinous procuticle that are produced as an extracellular matrix by the underlying epidermal cells. Here, we present our electron-microscopic study of cuticle differentiation during embryogenesis in the fruit fly Drosophila melanogaster. We conclude that cuticle differentiation in the Drosophila embryo occurs in three phases. In the first phase, the layers are established. Interestingly, we find that establishment of the layers occurs partially simultaneously rather than in a strict sequential manner as previously proposed. In the second phase the cuticle thickens. Finally, in the third phase, when secretion of cuticle material has ceased, the chitin laminae acquire their typical orientation, and the epicuticle of the denticles and the head skeleton darken. Our work will help to understand the phenotypes of embryos mutant for genes encoding essential cuticle factors, in turn revealing mechanisms of cuticle differentiation. Spatial distribution of calcite and amorphous calcium carbonate in the cuticle of the terrestrial crustaceans Porcellio scaber and Armadillidium vulgare. The crustacean cuticle is an interesting model to study the properties of mineralized bio-composites. The cuticle consists of an organic matrix composed of chitin-protein fibres associated with various amounts of crystalline and amorphous calcium carbonate. It is thought that in isopods the relative amounts of these mineral polymorphs depend on its function and the habitat of the animal. In addition to the composition, the distribution of the various components should affect the properties of the cuticle. However, the spatial distribution of calcium carbonate polymorphs within the crustacean cuticle is unknown. Therefore, we analyzed the mineralized cuticles of the terrestrial isopods Armadillidium vulgare and Porcellio scaber using scanning electron-microscopy, electron probe microanalysis and confocal mu-Raman spectroscopic imaging. We show for the first time that the mineral phases are arranged in distinct layers. Calcite is restricted to the outer layer of the cuticle that corresponds to the exocuticle. Amorphous calcium carbonate is located within the endocuticle that lies below the exocuticle. Within both layers mineral is arranged in rows of granules with diameters of about 20 nm. The results suggest functional implications of mineral distribution that accord to the moulting and escape behaviour of the animals.